Last night a group of us got together to try out the yakitori offerings at Kohnotori. This cozy little restaurant specializes in little skewers of grilled items (yakitori) and is best experienced with a group if possible so you can try out many little plates, as you would with tapas. Ice cold pitchers of Asashi draft wash everything down perfectly. It’s tucked right next door to the popular Imanas Tei next to Puck’s Alley in Moiliili. 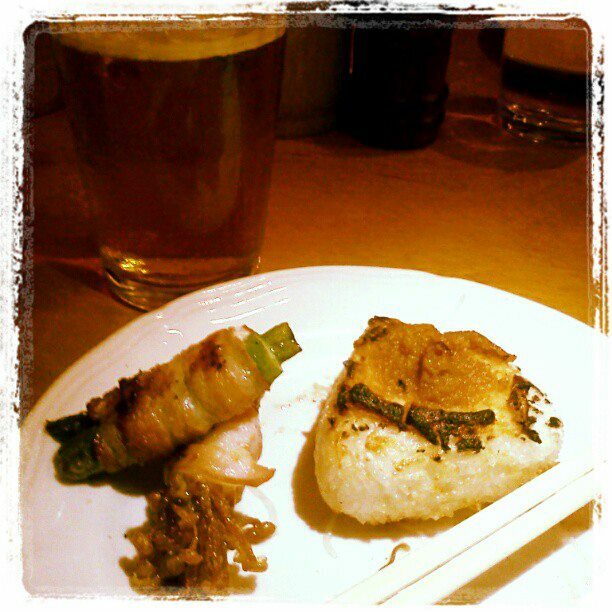 Bacon wrapped enoki & asparagus, with grilled musubi (miso) and washed down with Asahi! – Beef tongue (Gyutan) ($5.80) – Easily one of the crowd favorites of the night. We tried it both shio (salt) and teriyaki style, and shio won by a mile. Simple, grilled beef goodness with a slight char – squeeze a bit of lemon over it and it’s heavenly! – Bacon wrapped enoki mushrooms ($2.50) – You pretty much can’t go wrong with bacon wrapped anything. The enoki mushrooms were the favorite for most of the table, although I also liked the bacon wrapped asparagus. You can also get bacon wrapped tomato, quail eggs, and if you ask for it, mochi. I don’t think it’s on the menu. – Grilled musubi ($2.30) – We got them topped with miso, but shoyu is another option. The miso was a little too sweet for me, but I tend to like everything extra salty, especially to go with the beer. Others ordered the (non-grilled) musubi with cod roe, but it wasn’t a standout. – Monkfish (Ankou) liver ($6.80) – I actually didn’t think I’d like this, but I make it a point to try everything at least once. Once I had a bite, it made me realize I’d tried it before at Tokkuri-Tei! The ankou was actually quite delicious, although my first bite was wrapped in shiso which overpowered it. The second really allowed me to savor the smooth mousse-like texture of the liver, while the taste reminds me of fatty canned tuna. – Daikon salad ($5.20) – Shaved daikon is piled up atop a delicious shoyu-ume dressing. If you’ve had the raw potato salad at Pietro’s, you’ll enjoy this. It was a refreshing way to start the meal. The watercress salad was also light and delicious. Since I didn’t take too many photos of the dishes, check out the drool-worthy gallery over at Foodspotting. I should have been prepared better, I know, but I was “going with the flow” and seeing what the table would order and trying little bites of everything, even things I thought I wouldn’t care for like the monkfish liver and chicken gizzards. On my list for next time: the chicken meatball (tsukune), the arabiki sausages, fried garlic, ginko nuts and maybe some ramen. Also the “secret” menu items like garlic steak and bacon wrapped mochi. *Update – Went back and can now recommend the fried garlic ($3.90), dipped spinach ($3.80) and the takoyaki ($5.20) as well. The tsukune was bland so I don’t think I’d order that again. The bacon wrapped mochi was great! Ask your server if it’s available and if there are any “seasonal” items not on the menu. – This place is pretty small and can fill up quickly, so call ahead for reservations to avoid a long wait, especially if you’re going to be in a group. – Parking is tight and is shared with Imanas Tei next door, so if you don’t score there (none of us did) you’ll need to park in the lot in the back or find street parking. Give yourself some extra time just in case. – Although bills can be split up by using individual ordering checks, the food comes out quicker if you order on one ticket. Designate someone the “secretary” and have them write down the orders for the table. – Menu items come with either your choice of shio (salt) or teriyaki. In my opinion, the sweet teriyaki overpowers the flavors of the grilled items, so if in doubt, keep it simple and go shio. Ask for extra lemon for more flavor. Ooo…I think I went here once, years ago. And I do remember the parking was way tight but we did get one at least. A friend of mine recommended we go there one night since we weren’t too hungry and wanted something small so we got different dishes and she did order the beef tongue. Great post! Me too! I actually went two nights back to back since I liked it so much! I’ve been told I have to try Da Ala Cart though, to compare… And I want to check out Yakitori Glad too!